This is Sir Haus. He is three years old and we have had him since he was 10 months old. We acquired him from a Schutzhund instructor so he is very well trained. His only fault in the academy is that he would not attack and that he just wanted to be a pet. Sir Haus is by far one of the most beautiful dogs we have ever seen and we would like for many more people to see him. 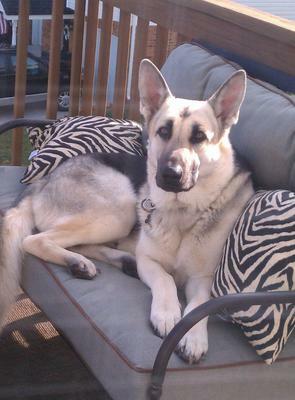 Thanks so much for sending in the wonderful picture of your German Shepherd Sir Haus. He is one handsome GSD. You are absolutely correct on that. Good for you on choosing him and having a well trained dog is a definite plus too. Schutzhund is a wonderful discipline but definitely not for every person or dog for that matter. Continued success with him in the future - I hope you have many, many years with him. Maybe in the future you can send us an update on hows he is growing up. Good luck! Sir Haus is a very Handsome male! I don't think he has any faults he is Perfect. If it come down to it and someone, a stranger, in a threatening way, I bet his German Shepherd's Protective will kick in. Take care of your boy and he we always be there for you!